The anti-Hamas rebels aim to renew the struggle against Israel after conducting new elections for parliament. The anti-Hamas 'Tamarod' (rebel) movement has singled out Israel to be their first and foremost enemy, and plans to resume the fight against Israel after establishing a new president and parliament in Gaza. The Tamarod movement was originally formed to topple then Egyptian President Mohamed Morsi and the Muslim Brotherhood administration. The Gazan version of the group has since been set up and aimed at deposing the Hamas led government in Gaza. 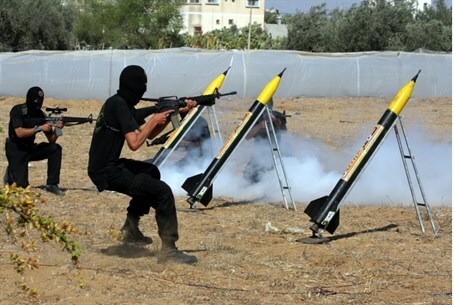 The Tamarod group has been active against Hamas, broadcasting messages against its leadership. The Tamarod youth movement calls Hamas a “gang,” slamming it as morally and financially corrupt, and blames the Islamist movement for the imposition of Islamic law on many aspects of Gazan life, corruption, killing innocent people, demolishing mosques, and oppressing the population of Gaza in the name of religion. In an interview on the movement's website, Abu Ruk, a prominent spokesman for the rebels, said that its members began to organize a revolt inspired by the Egyptian Muslim Brotherhood's removal by the military and plan to replace the current government of Gaza by holding new elections for president and parliament. The Tamarod movement stressed that they do not belong to any specific political party. Abu Ruk continued to say that Ismail Haniyeh, a senior leader of Hamas, has lost his legitimacy and does not represent the "Palestinian people," having committing faults similar to those of the ousted Egyptian government, such as forming a monopoly on the government and accusing people of being heretics of Islam. Currently, the Tamarod movement is preparing for mass-demonstrations to oust the Islamic Gazan leaders of Hamas this coming November 11th. The movement's attitude to Israel is no different to other Palestinian Authority organizations. Abu Ruk noted in the interview that Israel is the first enemy of the "Palestinian people" and after restructuring the Palestinian parliament, they intend to resume the fight against Israel.